Many American cookbooks had recipes for queen cakes, including Eliza Leslie’s Directions for Cookery (1840). We made Leslie’s recipe at the Mount Vernon cooking workshop, as well as one by English author Isabella Beeton, from her best-selling Book of Household Management (1861), a sort of domestic bible for the Victorian middle class. INGREDIENTS.—1 lb. of flour, 1/2 lb. of butter, 1/2 lb. of pounded loaf sugar, 3 eggs, 1 teacupful of cream, 1/2 lb. of currants, 1 teaspoonful of carbonate of soda, essence of lemon, or almonds to taste. Mode.—Work the butter to a cream; dredge in the flour, add the sugar and currants, and mix the ingredients well together. Whisk the eggs, mix them with the cream and flavouring, and stir these to the flour; add the carbonate of soda, beat the paste well for 10 minutes, put it into small buttered pans, and bake the cake from 1/4 to 1/2 hour. Grated lemon-rind may be substituted for the lemon and almond flavouring, which will make the cakes equally nice. Beeton’s queen cakes were heavier than Leslie’s, because of the higher proportion of flour, but I preferred them. They tasted like pound cake but with a nice crunchy exterior. 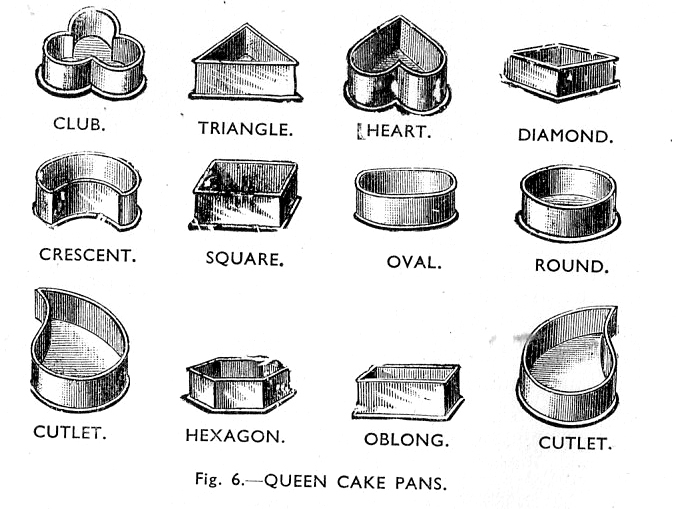 We made them with tart molds that resembled old queen-cake tins except for having ribbed sides (see photo below). These molds seem to make the cakes crunchier than modern muffin pans do, perhaps because they get very hot. Also, since the cakes are so little, there is more surface area exposed to heat. You need to butter the molds well to keep the cakes from sticking, and it’s important not to overfill them or you’ll end up with slightly blobby shapes instead of identifiable hearts, diamonds, etc. But they’ll still taste good! Below is a slightly adapted version of Beeton’s recipe, which I halved. I left her long subtitle in all its glory, however. 1. Preheat oven to 325°F. Generously butter about 20 small (approx. 2″) tart molds or one dozen muffin tins. If using molds, place them on a baking sheet. 2. In a large bowl, beat the stick of butter until light, about 1 minute. Slowly blend in the flour, then add the sugar and currants, and stir well. 3. In a medium bowl, beat the eggs until light, then add the cream and lemon zest and blend well. Add the egg mixture to the flour mixture along with the baking soda, and beat well for about 2–3 minutes if using an electric mixer, or 5 minutes by hand. 4. 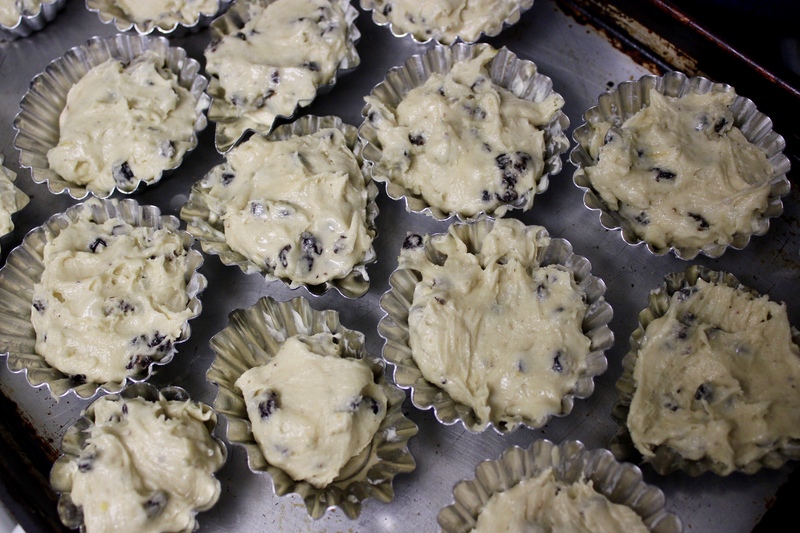 Pour the batter into the prepared molds, until half full, and bake for approximately 20–25 minutes. The cakes should be slightly firm and golden. (Baking time will vary depending on the size of tins used.) Remove from oven, let rest a few minutes until cool enough to handle, then carefully remove cakes from tins, using a dull knife or spoon to pry them loose if necessary. 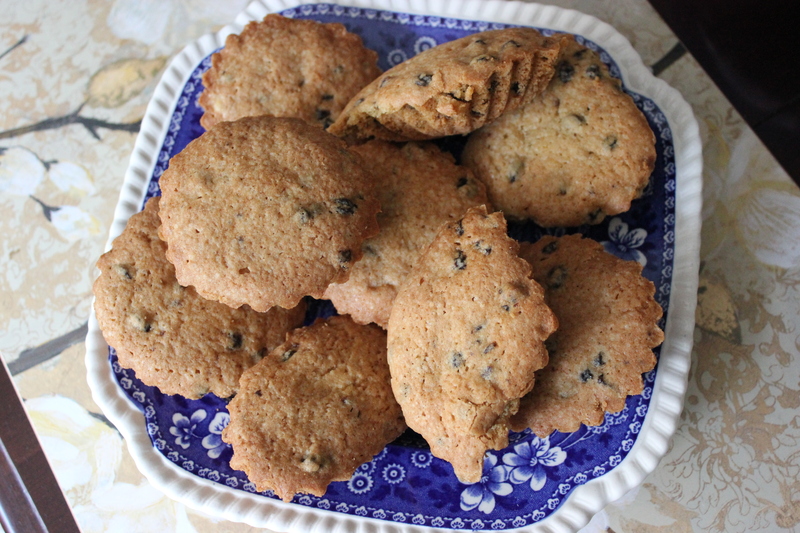 This entry was posted in cake, dessert and tagged 18th century food, 19th century food, baking, Book of Household Management, currants, Eliza Leslie, food, food history, Isabella Beeton, Portugal cakes by revolutionarypie. Bookmark the permalink. Great post! I also got a chuckle over Mrs. Beeton’s subtitle and peephole view of life in 1861. Fast forward 150 years and every parent has consolidated the duties of “…Housekeeper, Cook, Kitchen-Maid, Butler, Footman, Coachman, Valet, Upper and Under House-Maids, Lady’s-Maid, Maid-of-All-Work, Laundry-Maid, Nurse and Nurse-Maid, Monthly, Wet, and Sick Nurses, Etc.” Progress indeed! Thanks, Toni, and I thought the same! Maid-of-All-Work, for sure. I so enjoy your blog. Not only because I write about the time period, but I’ve a sweet tooth. So the mix of history and sugar is just what I crave. Glad you’re enjoying it. Thanks so much for writing! Thanks, Jama. Me, too. I want more of them!